A press trip for golf journalists sponsored in May by the Riviera Nayarit CVB has already resulted in seven published pieces generating over one million impressions—and all from just one of the writers that visited the destination. The purpose of the FAM trips organized by the Riviera Nayarit Convention and Visitors Bureau (CVB) through their public relations department is to position the destination and its products within specific markets. In order to determine the productivity of these trips one must analyze the ROI, which in the case of the press trip for golf journalists held to promote the Riviera Nayarit’s courses in North America—its natural market—is already showing unmistakable results. Of the three journalists that took part in the trip, one has already published seven articles in www.travelgolfmexico.com, www.golfadvisor.com and www.golfchannel.com; together they greatly exceed one million visits per month. The author in question is Jason Deegan, who has become an opinion leader on the topic; therefore what he publishes this summer will no doubt attract foreign golfers for winter games on the greens of the Riviera Nayarit. 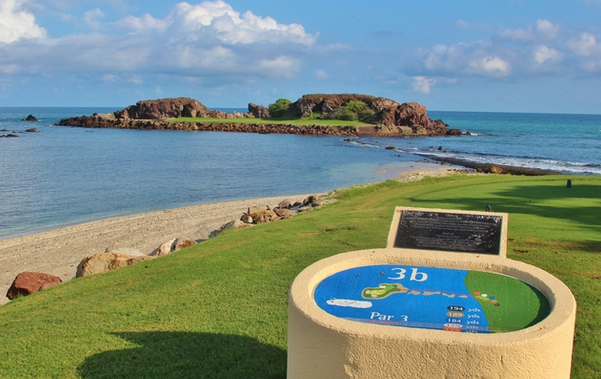 The Tigre, El Nayar, Flamingos, Litibú, Pacífico Punta Mita and Bahía Punta Mita greens each received a detailed review; there was also a special article titled “Four magical days of golf in the Riviera Nayarit, Mexico,” in which the author makes a series of special recommendations. “Generally a journalist comes to the destination with a single assignment, finds more than what was expected and, in most cases, ends up generating more than one article; this is usually influenced by the hospitality he or she enjoys,” commented Marc Murphy, Managing Director for the Riviera Nayarit CVB. According to information collected via tourist surveys conducted by the Riviera Nayarit CVB’s research department, over 14% of all the foreigners that visited the destination in June of this year played golf during their stay.